Short-sighted dogs need not suffer the embarrassment of bumping into lampposts any longer as a result of the newest pet accessory. An American company has just launched Doggles - canine spectacles with prescription lenses that can help older dogs who are losing their sight. At ￡40 a pair, the glasses, which come in a range of colours including pink, blue and black, are attached to the dog with straps. Their bizarre appearance - and the natural reluctance of some dogs to keep them on - will not deter dog-owners from using them, however, says their maker, Midknight Creation. The California-based company believes that the dog glasses will prove popular with owners anxious to improve their pets' quality of life. Many dogs suffer from diminishing sight as they age, forcing them to rely almost entirely on their sense of smell to get around. Specially trained veterinarians are able to determine what a dog needs by performing a retinoscopy, similar to how a ophthalmologist determines the prescription for a very small child who is too young to read the eye chart. "We've been doing research on this for about a year now," said Ken DiLullo, the owner of Midknight Creation. "We've spent a lot of money, but we think it was all worth it. People love their dogs and would do anything for them - they are really going to go for this." 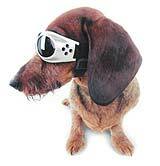 Before buying a pair of Doggles, an owner has their pet's eyes tested by a veterinary ophthalmologist. They will then be given a prescription. Doggles will be stocked in pet shops. They can also be ordered online from www.doggles.com. The glasses take about two weeks to make. The company already makes goggle-shaped sunglasses for dogs. Dismissed as a passing trend at first, the sunglass Doggles are now sold in 4,500 shops in 16 countries. Dog-owners with visually impaired pets warmed to the idea of being able to help their best friend - although some feared that the Doggles would draw unwanted attention. Sian James, a mortgage underwriter from Hemel Hempstead, Hertfordshire, whose 18-year-old cocker spaniel, Juno, is almost completely blind, said that she would have bought her pet a pair of Doggles many years ago if they had been available. "If the price wasn't prohibitive, we would have considered it, certainly. It seems a little odd, but anything that helps dogs must be a good thing," she said.Helen Drape, a housewife from Seer Green, Buckinghamshire, has a 13-year-old Jack Russell that has been slowly going blind for six years. "It is a great idea and I would really have been able to help Milly in the early stages of her illness," she said. "I would have bought them if they were available, but I wouldn't have let her out of the house in them. My friends would have taken the mick. Perhaps contact lenses would be less obvious." Dr Michael Brinkman, a veterinary ophthalmologist from Las Vegas who helped to develop the glasses, said that experiments had also been conducted with contact lenses. They were unsuccessful because dogs jumped and ran around too much to keep them in place. There was a similar problem with the Doggles, which was why they had straps, he said. Dogs also tried to pull the glasses off but they could be trained to get used to them. American veterinary ophthalmologists have been performing surgery and implanting lenses in canine eyes for more than a decade. Dogs with particularly bad cataracts, however, are unable to accept an implant. The lenses are unlikely to be available as bifocals in the near future. Dogs that do manage to learn to live with wearing glasses will have to settle for chasing squirrels - and leave the Sunday papers untouched.